Zinnia elegans and other varieties of the flowering annual are flashy sparkles of color that nearly anyone can successfully grow in their home gardens. Whether you grow them from seed placed directly in your flowerbeds, start your zinnias indoors or buy starts of plants from a nursery, they remain one of the all-time favorite garden flowers available. Butterflies love their cheery blossoms and stop by the colorful plants to harvest nectar, enhancing a garden’s viewing pleasure. Zinnias are an inexpensive plant to grow from seed. They grow well from USDA Planting zone 3 to 10 and there is no need to buy plants from nurseries or to start them indoors. All you need to have lots of lovely zinnia flowers is some decent cultivated soil, some zinnia flower seeds and enough water to give the seeds a good drink once they are planted. Zinnias love basking in the full sun and enjoy the warm weather. In fact, planting the seeds directly into the garden is the preferred method to get zinnia flowers, as they don’t like their roots disturbed. Zinnias range of size and color is as astonishing as its strength as a sturdy plant. The smallest varieties, like “Thumbelina”, reach about six inches tall, while larger varieties such as “Purple Prince” reach about 36 inches tall and have large, dahlia-shaped flowers of brilliant purple hue. Zinnias also have several types of flowers, depending on the number of petals on each flower. Single and double zinnias have two or more rows of leaves with a prominent center button. These zinnias look a bit like daisies. Dahlia type zinnias have many rows of petals, are larger in size and a less prominent center. There is also a cactus flowered zinnia. There is a size, variety, and color of zinnia for nearly every gardening situation. If you prefer to cultivate one of the wider, taller varieties of zinnia you may need to stake the plant when it reaches full height, to keep it from toppling over. Zinnia seeds prefer to be directly sown right into a sunny spot in your garden after all danger of frost is past. They also make lovely potted plants if the pots are large enough to contain the full grown flower plants. Once your soil temperature is over 50 degrees Fahrenheit, it is the right temperature to sow your zinnia seed. Loosen the soil where you wish to plant the seeds, add fertilizer and smooth out the cultivated soil. Next, place the flower seeds completely under the dirt, which means you’ll need to put them about 1/4 inch underground. Plant your seeds after all danger of frost is past. Consult with your local garden center for the approximate date. Be sure to plant your zinnia seeds a few inches apart to give them room to grow properly. Water your zinnia seeds in well. Zinnias take from 60-70 days to flower. If you’d like a quicker start to enjoying your zinnias, you may start the seeds indoors. The trick here is not to move around the plant’s roots when you transplant the full grown zinnia seedling. These biodegradable pots can be buried directly in the soil or flower containers such as decorative pots. Or start a few zinnias indoors and plant a few directly into the dirt for a variety of bloom times for your zinnias. Keep your seeds and seedlings evenly moist to prevent mildew and other diseases. When the seedlings are about four inches tall, transplant them carefully outdoors without disturbing the root ball. Your young zinnia plants may be placed outdoors late in the spring and covered at night until the evening temperatures are well above freezing. Place your zinnia plants permanently outdoors, uncovered, when all danger of frost is past for your gardening zone. Be sure to give your zinnia plants room to grow to prevent diseases and allow air circulation between plants. Do not water the plants just before night. There are newer variety of zinnias that are mildew and disease resistant for easier growing. After your zinnia blooms remains a good time to prune your zinnias. Keep zinnias blooming by removing the spent or dying blooms. Cut the stem back to a node to increase new growth and further flowers. Fertilize your zinnias by using a solution of 5-10-5 fertilizer mixed with the plant’s water. Zinnias don’t need lots of fertilizer, however. If you like large flowers on compact plants, choose one of the “Dreamland Series” zinnia cultivars. The flower heads of these beauties are big, fully double and can get to four inches wide. The stems get to about 12 inches tall. A long-time favorite is the “Thumbelina” Zinnia. It remains one of the smallest of the zinnias, with flowers about 1 ¼ inch across. Thumbelina grows to about 6 inches tall and spreads, making it a great filler plant. “State Fair” zinnias are some of the largest zinnias cultivated. They grow up to 30 inches tall with three-inch flower heads and come in a mix of colors. Zinnias remain a popular garden flower enjoyed by both young and old. 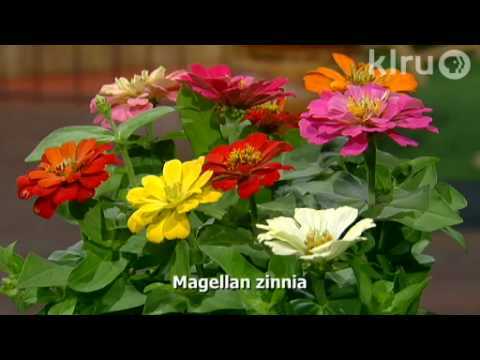 There are colors and sizes of zinnia for all types of planters and flower beds. Zinnias love sunny weather and heat, so plant some zinnias in that warm spot that is too hot for many other cultivars. Deer don’t like to eat zinnias, so planting them in you flowerbed may discourage deer and other animals from eating the surrounding plants. These charming posies resist diseases and are easy for even the beginner to grow. Try growing some zinnias this year for a lovely burst of color in your yard.